Can Susie Bubble survive a week's worth of monochromatic ensembles? 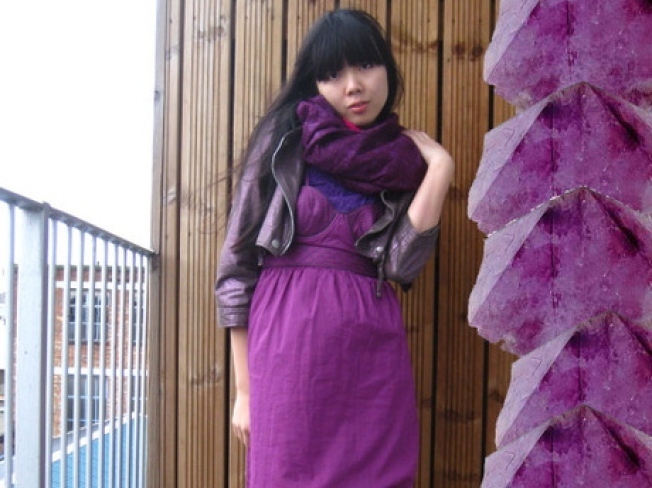 Blogger Susie Bubble attempts seven complete monochromatic outfits for a week's worth of looks. Adorable little bang-bedecked blogger Susie Bubble (not confirmed whether that's her real name or not) has posted some interesting tidbits on her Style Bubble blog, from bizarre, zipper-covered booties to the Whatty of the Week (long story). But this week, the wee writer was inspired by Fred Butler's seven days of rainbow style to see if she could create a whole week's worth of completely monochromatic outfits. The results are fairly impressive: Navy, yellow, purple, hot pink and more ... Though we have to say our favorite element of each day has to be the bizarre photoshop-meets-clip-art add-ons to each image, from leaves to bubbles. Well, that and the clearly-I-worked-at-this-pensive-face-for-a-while quality of her modeling. Overall, the feature seems to represent the classically misguided nature of fashion blogging: spending tons of time on one's self and strange fashion "missions" that in some cases are better suited for a diary you keep under your pillow than public consumption. But as we said, Susie's come through for us before, so it's hard to complain. Is monochromatic dressing the wave of the future? Only time will tell, though this feature had us missing Hillary Clinton's rainbow pantsuits. We'd bet Susie wouldn't be caught dead in slacks, though.